Although the yield curve remains stubbornly flat despite the economy's emergence from post–financial crisis malaise, bank stocks are on the verge of an upside breakout. But don't take our word for it, the Oracle of Omaha himself – Warren Buffett – just said in a recent interview, "I think, 10 years from now, that they'll be worth more money. And I feel there's a very high probability I'm right." Buffett is no stranger to banks. He's owned a piece of Wells Fargo & Co. (NYSE: WFC) for 19 years. And recently, he took some big chunks of some of the other big and well-known banks, including Bank of America Corp. (NYSE: BAC), Goldman Sachs Group Inc. (NYSE: GS), Bank of New York Mellon Corp. (NYSE: BK), and PNC Financial Services Group Inc. (NYSE: PNC). Now, JPMorgan Chase & Co. (NYSE: JPM) is the ninth largest stock in his holdings. Don't forget that Buffett swooped in with a post-crisis rescue package for Bank of America, buying $5 billion in preferred stock with an above-market 6% annual dividend. In 2017, Buffett cashed them in for a cool $12 billion profit, and that does not even include the dividends. It's no wonder banks hold a dear place in his heart. The good news is that any investor can invest like Warren Buffett by owning one the best bank stocks. And to help you find the winners, we're turning to the Money Morning Stock VQScore™. The VQScore tells us which stocks are great buys right now, meaning they are top-notch companies with stocks ready to break out to the upside. In fact, some of Buffett's favorites made the VQ cut, confirming that his thesis is on the right track. And it's no wonder, because banks are in the strongest position they've been in in a long, long time. Banks are much safer then they were a decade ago. None failed stress tests last year, and the list of problem banks shrunk considerably. Further, the FDIC reported last year that 96% of all banks made a profit. You might not find a more profitable industry. But that hasn't stopped Wall Street from getting pessimistic about banks. A flat yield curve can be a drag on bank earnings. This is because they borrow at short-term rates, such as the Federal Funds rate, and lend at longer-term rates, such as the 30-year mortgage rate. They make their profit on the difference between the two, so when short-term rates and long-term rates are close together, their profits can get squeezed. But then again, low overall interest rates, especially long-term rates, are the wind in the sails of the housing industry. 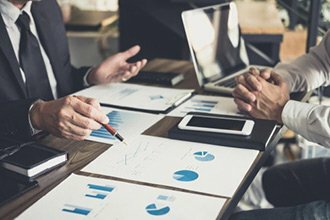 Bank profits may be lower, but transaction volume can be stronger, keeping their balance sheets happy. The U.S. Federal Reserve has all but guaranteed that it will not raise short-term rates this year, and that is actually a good thing for banks. Don't forget that while the Fed controls short-term rates, it is the market that controls long-term rates. There may be an emotional spillover of Fed moves into the long end, but that is not a real factor. 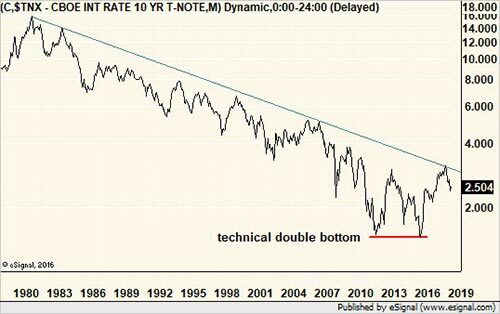 This is a chart of the benchmark 10-year Treasury yield going all the way back to the peak we saw in 1981. As we can see, the bearish trend in rates is close to ending. Chart watchers note the double bottom in 2012 and 2016, which suggests that was the floor, and lowest levels we will see in a generation. In other words, it won't take much to change this trend from long-term bear to long-term bull. It is already intermediate-term bullish from 2016. That's why we're following Warren Buffett's lead instead of some junior analyst on Wall Street. And we've uncovered a banking stock with serious upside potential.